Business Waste’s Mark Hall takes a look at how better recycling can help save the planet while saving your company money. What’s the big deal about rubbish? Can we copy the example of others? How can my company change? Here’s the bottom line: If your business isn’t already recycling its waste, then you are throwing money down the drain. It’s as simple as that, and it’s time to get on the (reclaimed cooking oil-powered) bandwagon, and find out how much money you can save while turning your company green. It doesn’t matter if your company employs one person or over one thousand, you should see it as your responsibility to ensure that your environmental foot-print is as small as possible through the most efficient disposal of your waste. And even the most “I’ve got no time for this, I’ve got a business to run” manager will find that it doesn’t take a great deal of effort to go green, and the benefits are seen in the most important part of your business – in your bank balance. The basic fact is this: No matter how big or small your company, you have to pay for your waste to be removed. Here at Business Waste, we’re able to find you the cheapest rates available, but they still have to be factored into you company’s budget where you like it or not. If you lump everything into a general waste bin that’s set for landfill, then everything you send gets buried in a hole in the ground, and that’s going to cost you money. At the moment, the landfill tax for what’s classed as “active waste” stands at £80 per metric tonne (July 2014), but will rise in line with inflation to £82.60 in April of 2015. That may not sound like much, but bear in mind that British industry generates tens of millions of tonnes of waste each year, and that’s an awful lot of money that’s being paid unnecessarily into the Chancellor’s pocket every year. We all hate paying too much tax – so why literally throw money in the bin because you haven’t got a plan together for recycling? What are we up against when it comes to rubbish? The stats for the amount of waste that the UK generates as a whole make pretty surprising reading, and figures released by the European Union show Britain pretty much mid-table when it comes to recycling our waste. While we still send about 50% of British waste to landfill (that’s something like 200 million tonnes being hidden in a hole in the ground because we’re not switched on enough to sort and recycle our waste properly), countries such as Germany, Switzerland and the Netherlands send nothing at all to landfill. Nothing, not a half-eaten sausage. 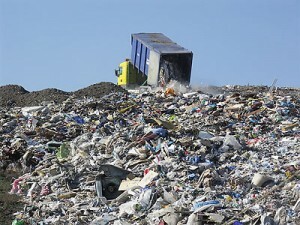 Depressingly, we are nearer to some of the EU newcomers like Bulgaria that recycles nothing at all than the efficient recycling regimes of Germany, Western Europe and Scandinavia, perhaps because we just don’t recognise the potential scale of the problem, and are quite happy to pay a landfill tax to make our rubbish go away. Granted, the likes of Germany got a ten-year head start on the rest of us, voting for Green candidates years before the environment became a fashionable cause elsewhere, but the fact that we’re still not even close to catching up speaks volumes for the poor attitude of business, councils and the British public when push comes to shove on the problem of rubbish. It’s pretty much safe to say that nobody likes having a waste recycling plant or an incinerator built near where they live, and with the plethora of red tape involved in the planning processes (not to mention a less-than-helpful attitude to green policies from our ‘greenest government ever’), we are still very slow on the uptake when it comes to a holistic approach to recycling, especially so when it comes to large capital projects. How can a small business like yours help? With landfill space across the UK running out (in some counties it has already reached a crisis point), you should make it your duty to recycle to the maximum, and press your local authority for more facilities to help with the wise re-use of everyday refuse. Encouragingly, statistics show a slow yet steady take-up of recycling, particularly in the domestic sector where councils openly encourage the pre-sorting of waste. 2012 figures show we’re pretty much on the European average when it comes to recycling and composting, but lagging on incineration/energy recovery schemes. However, with the European average being dragged down by a lack of recycling in Eastern Europe, it’s not a lot to crow about. Britain is just about getting the message on recycling, but it’s more of a slog than people hoped it would be. As long as “rebels” keep pushing their global warming conspiracy theories and reject 99% of all scientific studies on climate change and the environment, there’s enough of a get-out for businesses not to bother. Believe us, the time to bother is NOW. Here’s something you may not know if you’re a business leader in England or Wales: It is now the legal duty for every business in Scotland to recycle as much as they can reasonably manage. You might think this is the nanny state gone mad, but it’s a policy that’s popular and appears to be working. Scotland has led the way on a great deal of legislation that the rest of the country took years to follow. You might remember that the Scottish government made it illegal to wheel clamp on private property years before England and Wales followed suit, damning it as “legalised extortion”. The same is true for legislation on recycling and waste matters. Scotland and Northern Ireland’s respective assemblies lead the way – as usual – on the issue of disposable single use shopping bags, introducing a 5p levy on each one issued to prevent plastics going into landfill. This policy has seen the number of plastic shopping bags plummet in both regions, and the idea – after much resistance in London – will now become law in the rest of the country, and about time too. But Scotland’s gone many steps further when it comes to waste generated by business. The country’s Zero Waste Regulations are intended “to help Scotland become one of the most resource efficient nations in Europe”, and the latest phase in the plan came into force at the beginning of 2014. There’s a phased rolling out of key measures, which are designed to ensure a minimum level of waste and recycling services for all households and business in Scotland amid a plan to completely abolish the problem of biodegradable waste going to landfill. That’s one of the most important aspects of the Zero Waste Regulations – it’s a two-way street. While many laws simply ban or forbid certain actions, the new regulations offer people something in return for their efforts – a guarantee that authorities will assist them in their recycling efforts. It’s something that could be learned across England and Wales, rather than the piecemeal regimes we have at the moment, where county and municipal authorities are left to their own devices, and recycling levels vary from place to place. Initial indications after the first six months of the Zero Waste Regulations appear to show that it’s working. After initial fears that business take up would be low, thanks in the main to a lack of knowledge that the new regime was coming, it appears that Scots have embraced to idea of higher recycling, with three quarters of businesses having something in place by the end of June. Essentially, Scots businesses must now present metal, paper, glass, paper and card for separate collection. This waste is banned from going to landfill or incineration. Urban food businesses must now present food waste for separate collection, and this will (eventually) be banned from going to landfill. In return, waste contractors must supply a high quality recycling service, and local authorities must provide the same for domestic waste. It’s an enlightened policy that is producing results. The financial incentive? £10,000 fines tend to focus minds in board rooms and front offices. The “Every Can Counts” campaign is already a success in Scotland, according to a recent BBC report, with 600 businesses given assistance in attempts to recycle as many drinks cans as possible. Over 90% of Scottish businesses now have recycling targets, something from which the rest of us can learn. How do we get started on recycling? No matter if your business is just a few people, or a large establishment over several sites, you can do a great deal here and now. Much depends on what your local authority’s recycling and refuse collection policies are, but for most areas of the UK, you can simply pick up your phone to your business waste contractor and discuss your recycling needs with them. In most cases, a free audit of your waste output will tell you exactly what you need, and be it new bins or separate bags of recycling waste, any upfront cost will be offset in the long run by savings on your landfill tax payments. Let’s take a look at some of the specifics. The first thing you can do is to make a conscious decision to decrease your company’s waste. Whether if it’s for the love of the environment, or the love of your bank balance – it makes no difference. Make that decision, stick by it, and enthuse the rest of your organisation with the idea. The next thing is to audit your waste to see what you’re producing and find out the best ways to both reduce your refuse or increase your recycling. Speak directly to your waste contractors who will have years of experience in recycling, and they’ll be able to point you in the right direction. Depending on the nature of your business, you might be able to change ways of working so that less waste is produced, or you might want to discuss with your suppliers ways of reducing packaging for the goods in your supply chain. One of the major arguments small businesses have against recycling is lack of space. This is particularly the case in small premises or shop units where space is at a premium, and a second (or third, or fourth) bin would leave not enough room to swing the proverbial cat. Nevertheless, there are solutions out there. For example, you need not require a bin if there is a rubbish bag scheme in place. More frequent collections may also mitigate space concerns – for retail in busy shopping streets this is already a fact of life, so careful planning could make all the difference. The next thing to do is to find out what current arrangements for sorted waste are and make arrangements accordingly. Recycling arrangements differ from area to area and council to council, so there is no single regime in place. In some areas, there’s a requirement for pre-sorting of refuse for recycling, which means you’ll possibly need separate bins for glass, metals and paper/card waste. Pre-sorting might make life slightly more inconvenient for you – especially if you lack space for extra bins – but keeps collection costs down. Other areas will allow co-mingled waste for their recycling regimes. That means just two bins or sacks – one for general waste, one for all your refuse for recycling. It is – of course – much more efficient for you, but means extra staff costs at the recycling centre to manually sort waste, which is not the most pleasant job in the world. Even if you need a new bin or bin for your commercial recycled waste, you might have initial objections if there is a charge. Many commercial waste disposal companies offer free bins to their clients, so this need not be a problem. Like every good company, waste management firms such as ours rely on repeat business that comes from great service, so it’s in our interest to keep your costs down with a free bin. Whatever the local requirement, get your staff into the habit of recycling. Whether it’s at their workstation, in kitchen areas or shop front, get them into the mind-set that what they are doing is for the good of the company and – in the long run – their jobs. You might want to try some simple strategies in the work place if you’re finding it difficult to get going. •	Put somebody in charge of the recycling programme: Make them a point of contact for questions and answers on what item goes into which bin. The person concerned may need a little bit of education on what goes where, so it might help for them to consult with your waste contractor, or even get familiar with the Business waste website , we have advice on what to do with just about any waste item you care to imagine. •	Set targets: Setting a company target for recycling will help enthuse your staff. While there are obvious boardroom targets to set up (with the aim of bringing down your total landfill tax and waste collection charges) which go toward helping your company’s bottom line, targets also give employees something to work toward. Setting a competition with the stated target of reducing waste and increasing recycling might also increase work rate and turnover into the bargain, especially if there are bonuses or prizes at the end of it. •	Be open to new ideas: Every company is different with its own different needs and processes. As a business leader, you’re probably always ready to listen to a new idea if it helps you make more money or save staff time. The same goes with your waste management. It’s easy for these duties to take over and take up far too much time and effort, so be on the lookout for ways of doing it better, or listen to staff suggestions to make the process more efficient. Reward – we need not tell you – is a great motivator. Even simple things like flattening boxes the moment they’re empty and squirreling them away to the waste storage area save time and effort. The same goes for processes involving kitchen waste if you’re in food service – you’ll pretty soon have a way of working that makes ideal use of your staff and kitchen layout that works for you and removes waste for recycling or processing without effort and without addition staff cost. •	Team up with neighbouring businesses: You’re not in this alone. Whether you operate on a shopping street, in an industrial estate, or in offices, all your neighbouring businesses are doing the same as you with their waste management. If you’re in a chamber of commerce or another business community, speak to other bosses and find out how they’re doing it. Speak to your neighbouring companies to see if they’re doing something better than you (or tell them if they could do their job better). Ideas drive business, and the idea of recycling is one that can save money for every company in this country. As you’ve seen from this section, there’s a lot you can do, but it’s all a matter of stepping back and discovering minor changes in behaviour that can have big benefits. Fly tipping, or the dumping of commercial waste to avoid paying taxes or fees is a specific offence, and attracts unlimited fines. For repeat offenders, or people who fly tip controlled waste, there is the possibility of prison sentences. Fly tipping also includes businesses taking commercial waste home and trying to dispose of it with domestic waste, again to avoid paying landfill tax and collection fees. Domestic bin operators empty thousands of bins every day, so know what to expect from household bins. Anything unusual tends to stick out like a sore thumb, and crudely disguised commercial waste will set the alarm bells ringing. Don’t think they’re too busy to turn a blind eye, either. Councils can and will enforce penalties against this kind of behaviour. According to government statistics, fly tipping costs councils over £40 million per year, which could be diverted into other projects. In 2011, it was estimated that 75 incidents occur every hour, as individuals and rogue businesses attempt to avoid disposing of rubbish lawfully. With only one in fifty cases resulting in a successful prosecution, some businesses – particularly those in the building trade that generate a large mass of waste – think it a risk worth taking. 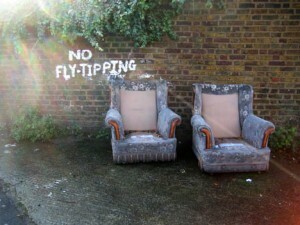 We spoke to one council in the south of England which has a problem with fly tipping in both rural and urban areas, and they tell us that despite restricted budgets, the tide is turning on fly tippers. Their new-found success was thanks to the advent of improved camera technology, which allows small, unobtrusive devices to be mounted overlooking known fly tipping hotspots. Activated by movement, enforcement officers are now able to film wrong doers in the act of dumping rubbish, and image quality is of such high quality they’re able to identify the number plates of vehicles involved, even in low light. Often used by wildlife enthusiasts to film wild animals in the dark, these cameras have found a new use in uncovering another sort of nocturnal creature – the night time fly tipper. The portability of these cameras means they can be moved around on a day to day basis, meaning large areas can be covered, collecting court-approved evidence at a relatively low cost. Frankly, fly tippers are found out sooner or later, usually by the incriminating letter-head or invoice somewhere in the rubble. It costs money, wastes time, and it’s not worth the risk. If you’re a law-abiding business owner, you know that fly tipping is a problem, especially if you’re in an industrial estate with dark corners that encourage this sort of thing. If it’s a problem for you and nearby businesses, don’t suffer in silence, report it. You might not think it’s worth it, but it certainly is, and enforcement officials might get a conviction sooner than you think. Don’t turn a blind eye. Recycling for small business: Whose problem is it? Recycling and waste management need not be a chore. Even if you’re a small office company with a couple of employees that has a small environmental footprint, you can do something. The same if you’re a shop, or a café, or a small engineering firm. Everybody’s different in their needs, but the bottom line is always the same: Rubbish and recycling is a global problem for business that needs to be addressed now. Speak to Business Waste now, and we can offer a free audit of your waste needs and set you on your way to a greener small business, while helping you to save money. Waste is not somebody else’s problem – it’s everybody’s problem.